1280H Ultra 1000 Line Res. Pro Security Warehouse is dedicated to ethical and responsible business practices on the Internet. Shop with confidence! From up to 16 entrances and 500 tenants, the GT series from Aiphone is a truely configurable audio and video communication and access system for multi-tenant buildings. This IP intercom adaptor allows an IE Series or AX-DM door station to remotely communicate with any amount of PC's within a LAN/Wan network. Power supply and software included. The JKS-IPED Set includes a door station, master station and a JK-IPW network interface adaptor to remotely communicate with up to 10 PC's within a LAN/Wan network. Power supply and software included. The JKW-IP is a unique adaptor that allows multi-function communication between sites. Interfaces with JK series videocomms to bring them on the network/internet. Software included. UL listed power supply with 120 volt input, two 12VDC or 24VAC class 2 rated power limited outputs and one amp continuous supply current. Battery backup capable, Indoor use only. This power supply has two 12VDC or 24VDC, class 2 rated power limited outputs and 1.75 amp continuous supply current. Battery backup capable, Indoor use only. This power supply is 12VDC or 24VDC power selectable with five individual PTC protected outputs. The unit has 4 amp continuous supply current when using 12VDC and 3 amp continuous supply when using 24VAC. Indoor use only. 24VAC power supply with sixteen individually fused outputs and 8 amp continuous supply current. Indoor use only. 24VAC power supply with four individually fused outputs and four amp continuous supply current. Indoor use only. The Altronix eBridge is a life saver and will allow IP Network cameras to operate properly over existing coax cable. Usable distance is up to 1500' - that is almost 5 times normal CAT 5/6 networking distance. This isolation relay provides a heavy-duty set of contacts that protect keypad's internal components. With a 1 amp continuous output, this device allows you to use your 12VDC camera with a 24VAC power supply. 24VAC power supply with four individually fused outputs and 6.25 amp continuous supply current in a NEMA 4 weatherproof enclosure. 24VAC power supply with four individually fused outputs and 10 amps continuous supply current in a NEMA 4 weatherproof enclosure. The Arecont Vision AV2100AI two Megapixel camera offers MJPEG image quality at 1600x1200 resolution for an incredible picture. Limited quantities available at this special closeout price. Compact size - 4 megapixel powerhouse! Twice the resolution of 1080P High Definition. Super wide angle lens. IR for all light conditions. Weatherproof. Easy to install.... Game changer! Tha Axis M3106-L mkII is an attractive indoor dome camera with a super wide (130 degrees) angle picture. Perfect for small spaces or where you want to see a lot of real estate! Superb 4MP image quality and IR for low light situations. The single-channel AXIS M7011 Video Encoder offers easy and cost effective integration of analog CCTV cameras into an IP-based video surveillance system. Features PoE and edge storage. The Axis M7014 four channel network h.264 encoder and offers edge storage using a micro SDHC memory card. This compact high performance unit can be powered by PoE. Offers the lowest cost per channel over other units. The Axis M7016 16 channel h.264 video encoder offers the highest density in the smallest space for the lowest cost per channel. This unit is capable at 30 frames per second in resolutions up D1 and includes PTZ camera control capability. Memory card slot. This 12" wall mount is designed to be used with the Bosch UHO series housing. CAT 6 PREMIUM CABLE - 1000ft. Standard CAT 6 crimp connector. 10 pack. NO TOOL REQUIRED. This CAT 6 keystone has a unique design for fast installations. Includes a standard beige single gang wall plate. Our best value lens for 2 and 3 megapixel HD box cameras. Excellent low light performance (f1.2) and adjustable from 2.8-10mm. A best buy. The Computar HG2Z0414FC-MP is for ½" format sensor megapixel cameras only. This is a 4-8mm auto iris Varifocal lens designed with more precise optics to keep a sharper image for MP cameras. The Computar T10Z0513CS is a 5-50mm Varifocal lens with a manual iris for a fixed but precise lighting adjustment for the camera. CS mount. For indoor applications with constant lighting. The Computar T10Z5712DC is a 10X motorized zoom lens – 5.7 to 57mm and has an auto iris and spot filter for older type PTZ cameras requiring a stronger amount of magnification. The Computar T3Z2910CS is a general purpose manual iris lens that will work well for most indoor applications with constant lighting. The Computar T6Z5710DC-CS is a 5.7 to 34.2mm motorized zoom lens for older style PTZ cameras. It has a DC auto iris and a spot filter. The Computar TG041FCS is a fixed 4 MM auto iris lens. CS mount. The Computar TG0812FCS is a fixed 8 MM auto iris lens. CS mount. The Computar TG10Z0513FCS is a 5 to 50mm varifocal auto iris lens. With a stronger zoom, this lens is perfect for those longer distance shots. The Computar TG2616FCS is a fixed 2.6 MM auto iris lens. CS mount. The Computar TG2Z1816FCS is a 1.8 to 3.6mm super wide angle varifocal auto iris lens. The Computar TG3Z2910FCS is a 2.9 to 8.2mm varifocal auto iris lens. This is a good all round general purpose lens for most applications. The Computar TG4Z2813FCS-IR is a 2.8 to 12mm varifocal auto iris lens. This lens is perfect for those that require a larger range of adjustability. This lens is IR corrected for better night time viewing. For 1.3 megapixel cameras, the Computar TG4Z2816FCS-MPIR is a 2.8-12mm auto iris varifocal for a wide range of adjustability from wide angle to telephoto applications. Protects IP cameras and other network equipment that use Power Over Ethernet PoE device power. 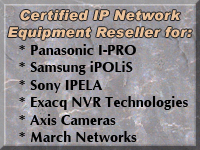 Protects IP network cameras and systems from surges on the network cabling and power supply lines. A 16 port rack-mount surge protector for your head end network data switch. Offers the best cost per channel for protecting your network gear. This surge protector is added to access control systems that utilize electric strikes or mag locks and provide protection to the control system's contacts from electrical surges that are generated evey time the door unlocks or locks. This is a single gang request-to-exit station with a stainless steel plate. Medium duty mount designed to be used with camera/lens configuration measuring 8" in length and maximum weight of 3 lbs. For wall or ceiling mounting. 9" heavy duty polished aluminum mount. The strongest mount we offer. Wall mount configuration. This audio/video transmitter operates on a 12VDC power source (not included) and transmits audio & video signals at 2.4GHz on one of 4 user-selectable channels. Standard proximity card for use with the ACC-950 and ACC-900 system. Proximity key tag for use with the ACC-950 and ACC900 system. 600 lb MAG lock with dual 12/24 voltage. 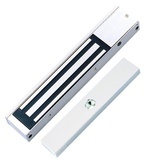 Great for small aluminum frame glass doors or any door that lacks sufficient clearance for our standard 1200lb mag lock.